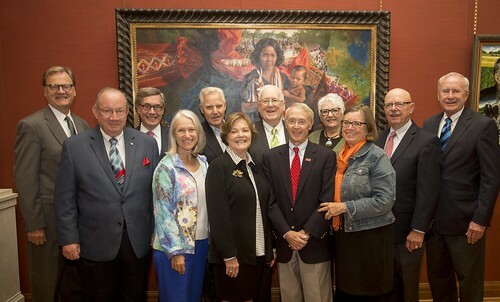 From left to right: Bev Evans, Carol Hunter, Scott Raecker, David Oman, Nicky Schissel, Susan Ramsey, Rabbi David Kaufman, Teresa Dunbar, Vicki Ray Carlson, Amb. Kenneth Quinn, Diane Graham, Roxanne Conlin, and Rick Morain. The World Food Prize announced, on what would have been Governor Ray's 90th birthday, September 26, 2018, that it will honor 14 individuals and organizations with the 2018 Robert D. Ray Iowa SHARES Humanitarian Award. The award will be given to those who, following the late Iowa Governor Robert D. Ray's inspired humanitarian leadership, made Iowa SHARES into a statewide campaign that delivered lifesaving food, medicine and volunteer doctors and nurses to the Cambodian border of Thailand, where thousands of victims of the Khmer Rouge Genocide had escaped. "I was with Governor and Mrs. Ray in that refugee camp on the Thai-Cambodia border in October 1979 where we saw the worst human suffering any of us had ever witnessed," said Amb. Kenneth M. Quinn, president of the World Food Prize Foundation. "Thirty thousand emaciated victims of the Cambodian Genocide were strewn across an open field, many too weak to move or help themselves. They were dying at the rate of 50 to 100 a day. The descriptions and images Governor Ray brought back to Iowa sent an electric current across the state which galvanized thousands of Iowans to come together to provide lifesaving assistance. This unusual number of recipients of the Robert D. Ray award reflects the many individuals and institutions that played a key role in one of the greatest humanitarian endeavors the state of Iowa has ever undertaken." The Iowa SHARES campaign, led by Governor Ray, brought Iowans together across all political, religious and cultural differences to rush lifesaving food, medicine and volunteer doctors and nurses to the Cambodian border in Thailand, where thousands of victims of the Pol Pot Khmer Rouge Genocide were suffering and dying in unimaginable circumstances. Over a two-year period, approximately $550,000 was raised from small contributions from thousands of Iowans across the state, which would be the equivalent of approximately $2 million in 2018. The announcement was made at the Dr. Norman E. Borlaug Hall of Laureates by Ambassador Quinn. Michael Gartner and Scott Raecker also spoke at the press conference. Governor Ray's Daughter, Vicki Ray Carlson, was also in attendance. "Iowa SHARES should have been named Iowa Receives," said Gartner, then editor of the Des Moines Register. "While the state of Iowa and its people compassionately shared almost everything they had - their time, their houses, their money, their families - they received much more in return. The people brought to this land by Governor Robert Ray and Ken Quinn have forever enriched this state and the lives of all of us who live here. Iowa SHARES was a wonderful program - for all of us." The late Dr. Rosenfeld, representing the more than 10 Iowa medical professionals who volunteered to serve in Cambodian camps through Iowa SHARES. Three traditionally separated elements in our society - government, religion and the press - were drawn together through the Iowa SHARES campaign. Upon his return, the Governor shared deeply affecting photographs with reporters, who incorporated the photos into news articles. These stories led to editorials, public television documentaries and news stories across the state. An interfaith coalition of religious leaders endorsed the campaign and urged Iowans to unite in the efforts to aid the refugees. Leaders of both political parties joined with the Governor in creating a non-profit organization that inaugurated the SHARES campaign a day before Thanksgiving. Between Thanksgiving and Christmas of 1979, the campaign raised over $125,000 and rushed food and medicine during the week of Christmas to 30,000 refugees in two separate camps. In addition to sending lifesaving food and medicine, Iowa sent volunteer doctors and nurses to provide medical care in the refugee camps. Iowa SHARES continued to raise money over the next two years that supported Iowa doctors and nurses serving in hospitals at the border.